On hot days, it’s easy to dread getting into your car. The sun beating down can make the seats hot to sit, the steering wheel too hot to touch, and the air too hot for relief. Not only is it impossible to get comfortable, but your vehicle’s interior surfaces also start wearing down faster from sun damage. But there is a solution! 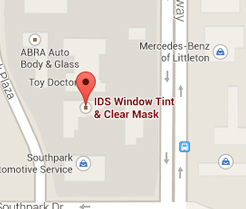 Window tint and films allow you to stay cool and protect the interior of your car! All our films block 99% of the sun’s UV rays – protecting the passengers from heat and sunburns and protecting the vehicle interior from sun damage. Our window films are also non-metalized, so they won’t distort radio or navigation signals. You can maintain the original look of your car with light window films, or create a custom look with dark window tints. Custom tint packages are available to achieve the right look for you! We carry standard Madico films, as well as high performance 3M Crystaline and Wincos films. These new state-of-the-art high performance films, also called spectrally selective or infrared rejecting films, specifically target the infrared (heat) bands of the sun’s solar spectrum. This allows for very high heat blockage without needing a dark tint. High performance window films use a proprietary, multilayer optical film technology – combining over 200 layers in a single film that is thinner than paper! Because this filter specifically targets the infrared/heat waves, the films achieve the same heat rejecting properties even with lighter films. Window films reject up to 60% of the total solar energy and up to 97% of the heat-producing infrared rays. Not only do the tints and films reduce the heat in your car, they also block harmful UV rays to protect the vehicles interior and passengers. Window films provide a total Sun Protection Factor (SPF) of over 1000! This protects both the occupants and the interior of your car from the harmful effects of the sun. Window films also enhance your view and vision. Blocking the heat while allowing visible light in, window films allow you to see clearly, with low reflectivity on the film itself. The variety of tint levels available allow between 40% and 90% of visible light into the vehicle. This warranty covers everything but normal scratches and dings, such as from the seat belt. The 3M Crystaline window films are also backed by a limited lifetime warranty by 3M, which covers replacement in the event of bubbling, peeling, blistering, or purpling. Our window tints are durable, designed and installed to last maintenance free! To create a custom look and protect your vehicle, stop by our shop or call (303) 734-4500 to learn more!